The premise held by many Christian Zionists across America is that God is the creator, sustainer and protector of the modern State of Israel. This very flawed, theological presumption is false, and the historic record proves it. The real creator of modern Israel is the Rothschilds, and the true sustainer of Israel all these decades is the United Nations and the U.S. Pentagon. Without the rabid support of the Rothschilds and these two institutions Israel would have failed a long time ago. "Edmond de Rothschild (1845-1934) was the youngest son of James and Betty de Rothschild. He bore the Hebrew name Benjamin. He was born in Paris on 19 August 1845. Edmond joined the Paris Banking House in 1868 becoming a director of the Est railway company and other family concerns, and devoting himself to art, culture and philanthropic interests. In 1877, he married Adelheid (1853-1935), the daughter of Wilhelm Carl Rothschild (1828-1901). Well before WWI and WWII the Rothschild family was relocating European Jews to Palestine on the behest of Zionists in Europe. The most notable Zionists pushing for this migration was the writer of Der Judenstaat (The Jew State) Zionist Theodor Herzl and, the man responsible for the Balfour Declaration Chaim Weizmann. Just this February on the 100th anniversary of the Balfour Declaration, Lord Rothschild was interviewed by a former Israeli Ambassador on his families role in the establishment of the State of Israel. In the below interview Lord Rothschild revealed his cousins critical role in connecting Chaim Weizmann with the British aristocracy in hopes to influence the then political leaders to help migrate Jews to Israel. At this time Zionist were divided as to how to achieve a mass migration of Europeans to Palestine. The Balfour Declaration was addressed to the eccentric Walter Rothschild and solidified international support for a Jewish state, there were still two major obstacles preventing the rise of a Jewish homeland. One, the Ottoman Empire, who disallowed Jews to settle in Palestine, and two the fact that European Jews didn't want to go to Palestine, seeing that they were very wealthy and well-off in Europe. The Zionist cause was a minority cause among the people. Enter WWI and WWII, both were critical in paving the way toward a Zionist takeover of Palestine. Listen to this interview with Professor Antony Sutton who details out the Wall Street (Rockefeller) and Rothschild financing of all sides of these two Wars. WWI is said to have been started because of the assassination of Austrian Archduke Francis Ferdinand by the secret society the Black Hand. This war was extremely bloody, and unnecessary for the world, but for the Zionists a perfect excuse to embroil the already crumbling Ottoman empire into a war that would spell their demise as a world power and controlling factor in Palestine. Their plan worked perfectly, and in 1920 the Treaty of Sèvres dissolved the Ottoman Empire eliminating any opposition to a Zionist migration. WWI also established the League of Nations which was the first globalist entity, and precursor of the coming U.N.
WWII also a Zionist backed war, served to frame Hitler as the oppressor of the Jews. This tension is what created the situation where German Jews would do anything to escape the persecution of the Nazi party. Conveniently the Zionists negotiated what is now famously called the Transfer Agreement, an agreement between Zionists and Hitler allowing German Jews to liquidate their German wealth in exchange for a plantation in Israel at the height of WWII. You can watch this incredible interview with author Edwin Black writer of the book the Transfer Agreement detailing how Zionist and Nazi Germany struck this deal that allowed for a mass migration of Jews to Palestine. Incredibly he details how it was Jewish boycotts that started Hitler on a path towards the Holocaust. Hitler rightly blamed the Jews for the economic destabilization of Germany, thus the persecution, thus the need to negotiate an end to the boycotts with the Zionists seeing it was they that pulled the strings on these events. At the end of WWII On Nov. 29, 1947, the United Nations General Assembly passed a resolution calling for Palestine to be partitioned between the Arabs and Jews, allowing for the formation of the Jewish State of Israel. This is the diabolical history of the World Wars, a bloody plot to create the perfect circumstances for the rise of the Jewish State called Modern Israel. Please like the Wake the Church facebook page, and also sign-up for our Newsletter. When Christians think of Israel they are foolish to say that the modern state of Israel is a work of God. 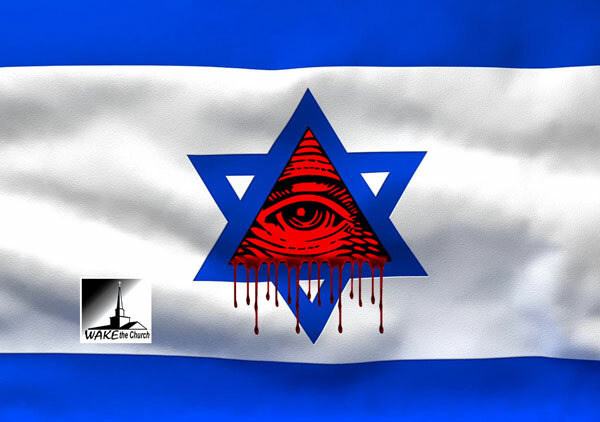 Israel is a work of some of the most nefarious and wealthy families on the planet. Families that have recorded ties to occult fraternal orders, and their ambitions are anything but Godly. If Israel was truly a work of God, then God would be Israel's protector and sustainer as we see throughout scripture. God fought on behalf of Israel on numerous occasions. Instead what we see is that despite all of the help from these wealthy, warmongering families, Israel is wholly reliant on U.S. financial aid of $3 billion annually, and recent military aid totaling $38 billion. If the money and extensive military support were to dry-up then Israel would fail having no allies or means to protect itself in the region. It truly is propped up by the powers of this world, rather than God, and according to the Bible who is the spirit behind worldly powers? You guessed it Satan, who flaunts the power in Matthew 4 to Jesus Himself. Remember they were looking toward Jerusalem in this passage, a kingdom out of many that the devil owns lock, stock and barrel, even to this day just like all the others. The entire premises of Christian Zionists is that the modern State of Israel is a fulfillment of Biblical prophecy and an act of God going back to Genesis 12:3. What they don't take into account is that the promises made to Abraham were totallu fulfilled in Christ Jesus, and has nothing to do with land. It had everything to do with whether or not they would maintain God's laws. God continued and fought for the Jews as long as they kept his commandments. Israel having fallen into idolatry and sin rejected God, crucified Jesus and as a result was cursed and destroyed utterly, not blessed. The ancient Jews whored after false gods, money, war, power and sexual perversity, just like they do today. For Christians to turn a blind eye to the many sins of the modern State of Israel and give them a special status is to enter into their curse, not their blessing. The Jews were lost in Jesus' time, they were lost while under Hitler in Germany and they are still lost as occupiers of Palestine. The truth is without the support of the un-Godly, satanically inspired dynastic families, and the loss of millions of lives in two World Wars, there is no way Israel would exist to this day. Even former AIPAC member and author Richard Forer readily admitted that without U.S. intervention there would be no Israel to this day. So with all of this being said, Christian Zionist who blindly support Israel as an act of God can now know that it is nothing of the sort. The State of Israel was a Rothschild/Zionist creation, that alone should tell you it was not an act of God, but even still without the obscene level of aid given to Israel by the U.S. it would fail almost immediately. No God did not intervene to create the modern State of Israel, the Rothschild war-pigs did that, and also let it be known that God does not protect Israel, that job is the internationalists at the U.N. and the tax dollars and blood of the U.S. soldiers. Given the fact that these Zionists have embroiled America in more wars and spilled more American blood over the course of the last century than any other cause. Our support of Israel is an American curse, and not as the Christian Zionists say our blessing. Israel in my educated and researched opinion is a work of Satan, and not God and thus has been a blight on history and the peace of the world ever since.